armed with umbrellas (three beaches on the entire island are equipped), you can explore the many beaches and coves of the island, that represent his pride. The most curious travelers are suggested to rent a boat to discover La Maddalena from the sea, so seeing new perspectives and new faces of its beauty. A few kilometers separate the hotel from the city center of La Maddalena, which offers a wide selection of typical restaurants. The ideal place for a pleasant evening stroll and for relaxing after the heat of summer days, wandering through shops where to buy souvenirs and local craft. 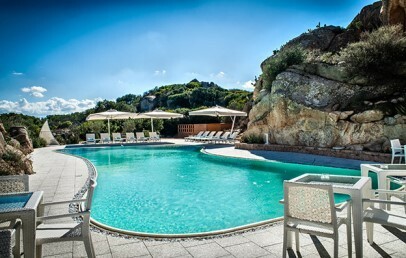 The Grand Hotel Ma&Ma is placed in Punta Tegge, a seaside resort in the south-west coast of the island of La Maddalena. La Maddalena Archipelago is a protected National Park since 1996: a natural treasure with a caribbean sea, sandy beaches and able to offer a unique holiday experience. The Grand Hotel Ma&Ma is located only 350 metres away from the sea and the property is surrounded by three hectares of Mediterranean vegetation. To get to the nearest beach you need to cross the garden and the street, beyond which you get to the beach. To reach the island of La Maddalena, is necessary to reach Palau and take one of the ferries (very frequent during the summer season) that connect Sardinia to the Archipelago. The new Grand Hotel Ma&Ma is a 5-star luxury resort. It is important underline as the elegance, exclusivity and high quality of the Hotel services have a minimal environmental impact: a large area presenta a photovoltaic surface and is run using renewable energy sources. 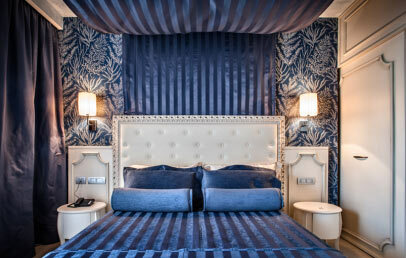 The 92 rooms of the Grand Hotel Ma&Ma feature a chic and trendy style. They all have a spacious bathroom decorated with marble and mosaics and a large shower, hairdryer and a complimentary toiletries by Acqua di Parma. 1 Spa access per person per stay – silver card – includs access to the SPA with sauna, Turkish bath, emotional showers, Magnapool pool, Tecnogym gym, tea and relaxation room (duration 2 hours, reservation required). Classic – 22 sq.m., characterized by a romantic or casual atmosphere, they have a balcony with patio/garden view. Superior – 25 sq.m., characterized by a romantic or casual atmosphere, they have a small terrasse with patio view. Deluxe – 30 sq.m., located on the top floor of the hotel, they are characterized by a fashion style and have either a terrace or a balcony with view. 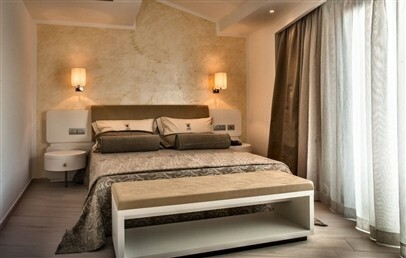 Family Room – 40 sq.m., they are ideal for families and can accommodate 4 people. They consists of a spacious double bedroom and separate living room with sofa bed. The Family Rooms have a terrace or a balcony. The nearest beach is located 350 m from the Grand Hotel. It is not equipped and is reachable by crossing the garden and the street. By car, bike or scooter you can discover every day a different bay of the islands of La Maddalena and Caprera. The SPA has a surface of 800 sqm, a real wellness oasis of the Grand Hote Ma&Ma. They feature the product line of "Erbe di Sardegna" with local and natural products. It guarantees the latest treatments based on advanced scientific research and promoted by a professional staff. 1 Spa access per person (adult) per stay – silver card – includs access to the SPA with sauna, Turkish bath, emotional showers, Magnapool pool, Tecnogym gym, tea and relaxation room (duration 2 hours, reservation required). The fitness room of the Ma&Ma, exclusively at guests disposal, is equipped with touch-screen Technogym machines. Guided by a personal trainer, you can choose the most suitable program for your training. The Grand Hotel also invites you to attend the diving school, diving tours and snorkeling, hiking trails and guided tours. L’Antica Isola Restaurant provides a great sensorial experience thanks to the Executive Chef Agostino Simeone. The Restaurant can host 180 guests and offers a menu of revisited traditional Sardinian recipes based on local raw materials and seasonal products. The Grand Hotel Ma&Ma guarantees a multilingual concierge service, at your disposal to suit all your requests and preferences. Available forthe guests are also a lounge bar, a conference room, a games room, a lounge area on the top floor of the hotel with a panoramic roof garden and an outdoor swimming pool. A complimentary shuttle service to/from the historic center of La Maddalena at fixed times is available. 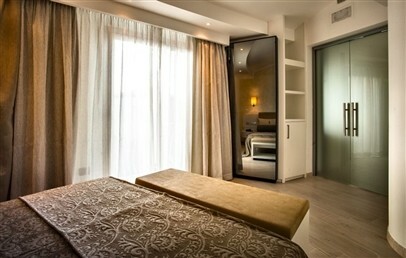 The Deluxe rooms are located on the upper floor of the hotel. They feature a fashion style that emerges from the play of lines, rectangles and cubes. The furnishings and decor are inspired by a simple design with a great visual impact. The large bathroom, with mosaics and marble, is equipped with king-size shower, hairdryer and complimentary toiletries by Acqua di Parma. All Deluxe rooms have a terrace or balcony with view. The Family Rooms are located in the ground or in the upper floor of the hotel. They feature a minimal style that emerges from the pastel and gold colours of details, the natural nuances of the refined linen and a successful trick of light. They consist of a spacious double room and separated living room with a double sofa bed. The large bathroom, with mosaics and marble, is equipped with king-size shower, hairdryer and complimentary toiletries by Acqua di Parma. The Family Rooms have a terrace or a balcony. Each rooms is characterized by either a romantic atmosphere or a mix of classic and modern style, with wood furniture and refined textiles. The bathroom has a shower, hairdryer and complimentary toiletries. Guests of the Secret rooms have 1 entrance included at the Spa. The open space Junior Suites are located on the ground floor and offer a large terrace. The room has a kingsize bed, LCD TV with satellite channels. The large marble bathroom has a big shower and modern comforts. 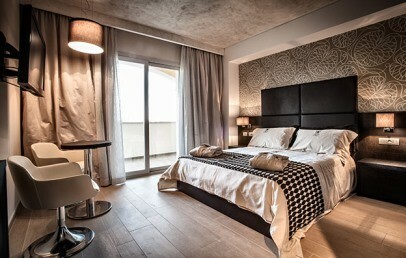 Comfortable double room furnished in a modern style. A spacious bathroom en marble and with mosaic details with big shower and courtesy set of Acqua di Parma. A private balcony offers a view over the patio/garden. This room can accommodate up to two people. 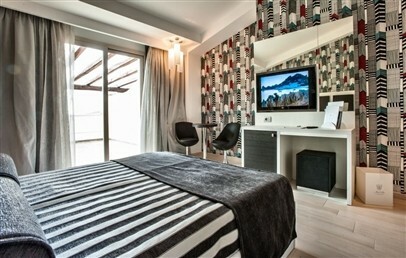 Comfortable double room furnished in a modern style. 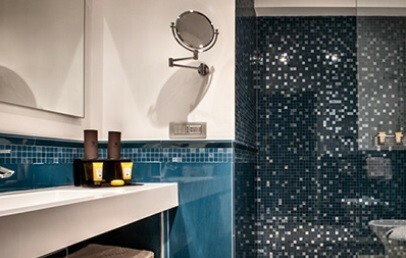 A spacious bathroom en marble and with mosaic details with big shower and courtesy set of Acqua di Parma. A private veranda offers a view over the patio. This room can accommodate up to two people. Early Booking - Book within May 30 2019 and get a 10% discount on your stay! The baby cot is to be asked upon reservation and to be confirmed by the hotel; it costs € 30,00/night, to be paid locally. If the cot is not available, the child will have to share the bed with his parents.